We were all excited on Wednesday when we thought we were finally going to get some snow here in NYC. But no, unlike other parts of the country, all we had was just a squall. What to do? 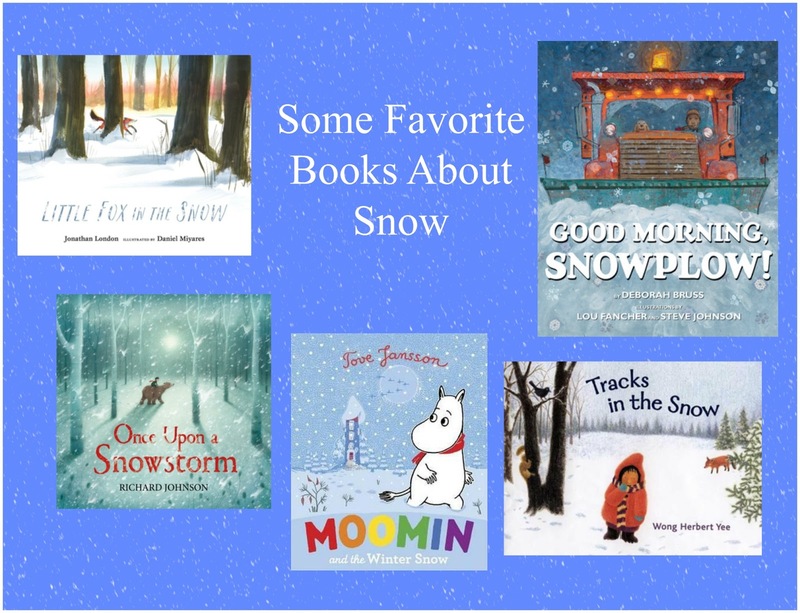 Why, break out some good snowy picture books, of course. Sunlight shining on a young sleeping fox in his burrow wakes him up, and as he sticks his head outside, looking around at the snowy forest, he realizes he is hungry. It is time to hunt for his next meal. Following his instincts, the foxling hunts down a mouse, but it isn't enough to satisfy his hunger. Following tracks, the young fox finds a rabbit, then gets a nice drink from a cold stream. But the hunter soon becomes the hunted when the little fox meets a hungry wolverine. 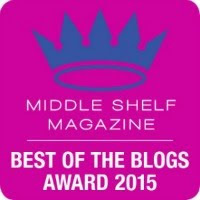 Will the foxling escape in time to dream away another night with a full stomach? 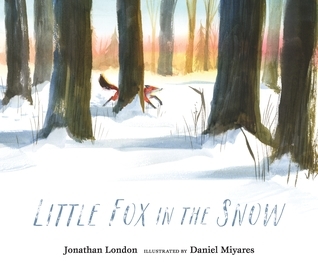 Daniel Miyares ink and watercolor illustrations capture the cold of winter, and the red fox against the white snow keeps this story focused. Told in free-form poetry, the story of a winter day in the life of a little fox's is not the kind of cute stories about forest animals kids so frequently hear, but a more authentic, realistic picture of survival of the hunter and the hunted, and how that can change so quickly so the hunter becomes the hunted. Though the illustrations also have this authenticity to them, the more gory details are NOT part of the picture. 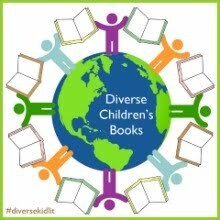 I would recommend taking to any child you might want to share this book with. 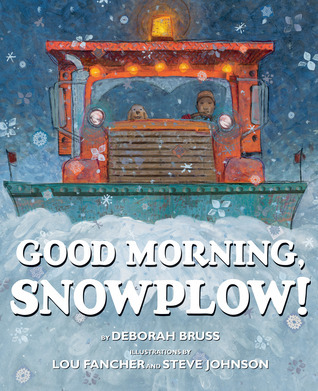 As night falls, it's time for everyone to go to sleep but when snow starts falling, it is time for the driver and his snowplow to go to work: Good night, farms, and good night, town./Tiny flakes start twirling down./Good night, playground turning white./ Good night, snowplow? Not tonight!" Step by step the driver makes sure the plow is in good order and snowstorm ready. As snow piles up, off they go to plow, salt, and sand the roads, calling a tow truck when a car drives into a snow mound, waiting for a passing train to go by, and cleaning snow off the lights and wind. By morning, the snow has stopped, the roads are plowed and it to go to sleep. 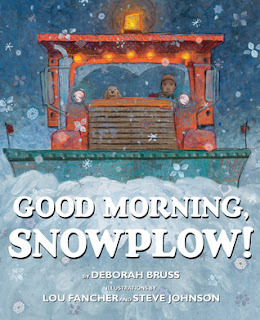 My kids loved this book, especially the part where school is cancelled. 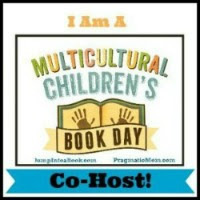 The whole book is told in rhyming couplets and has a great rhythm to it, perfect for read alouds. The illustrations, done acrylic paint, colored pencil, pen, and collage really express the quiet intensity of a snowstorm, the loneliness of a nighttime plow driver, but this one brings along his faithful canine companion. I thought it was a nice touch that the driver is Asian, even though it is not part of the story or even mentioned. Still grieving the loss of their wife and mother, a young boy and his father, living on the edge of a wood, discover they have no food in the midst of a snowstorm. The two bundle up, dad carrying a rifle, and the two head out to hunt. The storm is so intense, father and son soon get separated. Tired from looking for his father, the boy falls asleep under the constellations of various star animals, only to wake up and find himself surrounded by forest animals, including a very large bear. Needless to say, everyone is surprised. The boy shares some candy, and together with the animals, he dances and draws cave pictures of animals with the bear. But soon, the boy begins to miss dad and home. so off he goes, riding the bears back. Once father and son are reunited, dad raises his rifle to shoot the bear, until the boy explains what happened. Rather than shooting the bear, the father and bear shake hands. 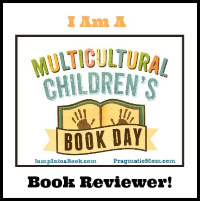 This is a wordless picture book that clearly tells a story all my kids were able to understand without too much prompting from me. They even added some of their own wonderfully spot on narration to the story. 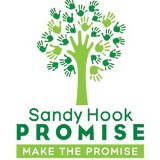 There was a long discussion about the boy's deceased mother and the red-polka dot scarf served as a red thread to connect mom with the reconciliation and new found appreciate the for nature of father and son. It's clearly a fantasy story but the message is not. My kids did wonder if it was all a dream influenced by the constellations over the sleeping boy's head. Whatever your conclusions, this is a wonderful book with incredible illustrations. 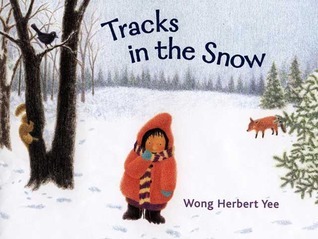 It's a snowy day and a young girl in a red coat has decided to trace the tracks she sees in the snow outside her house. With a refrain of "Tracks in the snow./Tracks in the snow./Who made the tracks?/Where do they go?" 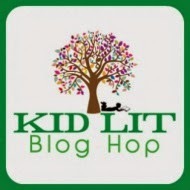 which kids will quickly pick up and repeat with each reading, the girl begins to eliminate who the tracks could belong to forest animal by forest animal. What a surprise when she realizes that the tracks in the snow are the ones she had made the day before while she was out playing in the snow. 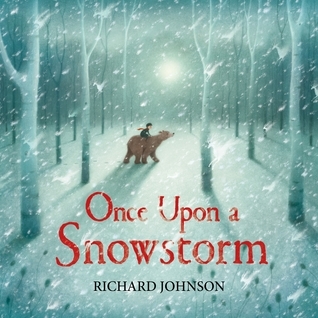 The story is told in a sweet rhyme and enhanced by the lovely Prismacolors on watercolor paper illustrations that give them a soft, slightly burred look that really imparts the sense of a snowy day. This was fun to read with my young readers who not only repeated the refrain, but liked naming the animals shown throughout the book. They could also see that the tracks were not made by animals, and had fun guessing whose they could be on out first reading, which didn't diminish their enjoyment at subsequent readings. 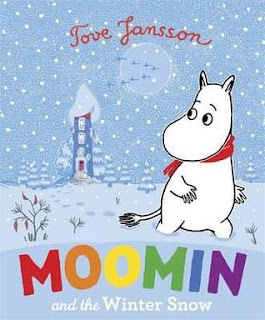 I've had this book since it was first published but have never used it with young readers because most American kids aren't familiar with the Moomins yet. 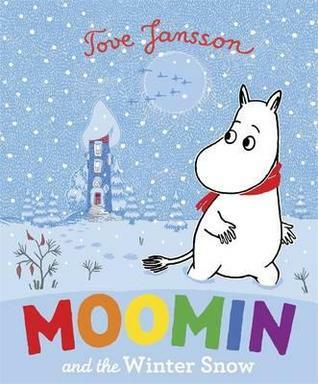 Also, this book is only based on the Moomin stories of Tove Jannson, not written by her. This year, I decided to give it a go and see how it was received. It is starting to get cold and as everyone knows, Moomins hibernate for the winter. Before that happens, Moomintroll goes looking for his best friend Snufkin. Snufkin was getting ready to head south for the winter, since he didn't hibernate. The two friends say goodbye, but even though Snufkin reassured Moomintroll he would return the first warm day of spring, just as he did every year, Moomintroll was sad to see his friend go. Feeling dejected and alone, no one could convince Moomintroll of Snufkin's return. Would he miss Moomintroll as much as Moomintroll would miss Snufkin? Moomintroll is finally reassured when Moominpappa gives him a little parcel - a note and tiny sailboat to sail when together when he returns in spring. This is a nice story about friendship and about learning to express sadness. 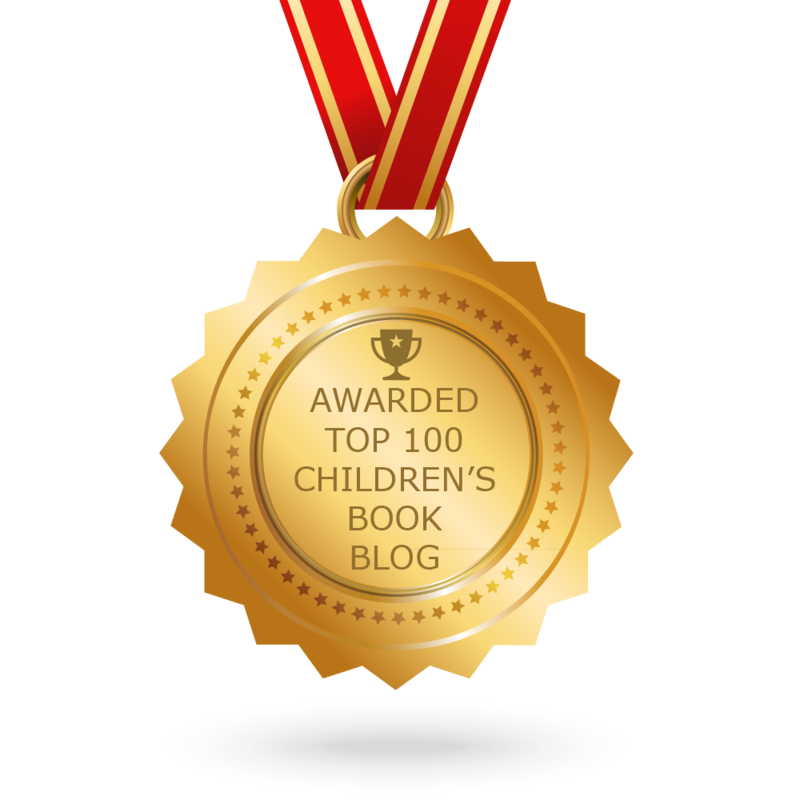 My young readers actually liked this book a lot, including with the way it was written and the illustrations. It opened up a really nice dialogue about missing people, mostly grandparents and friends who have moved away. There are a few more Moomin picture books based on Tove Jansson's original stories which my kids would like to read as well, so yes, you could say they were quite taken with the magic of Moominvalley and its inhabitants. 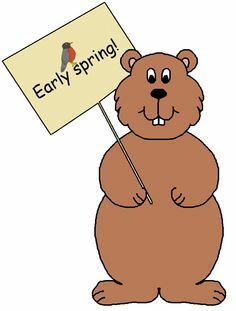 Here's a bit of good news - today is Groundhog Day and Punxsutawney Phil did not see his shadow and has predicted an early spring. Unfortunately, Phil is only accurate 39% of the time. Fortunately, there is Staten Island Chuck, who also did not see his shadow and he has been accurate 80% of the time, so hope springs eternal when it come to an early spring. I've bookmarked this post to get some of them for the grandkids. 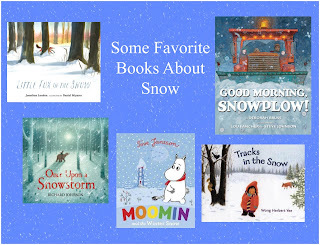 I especially like the snowplow one.